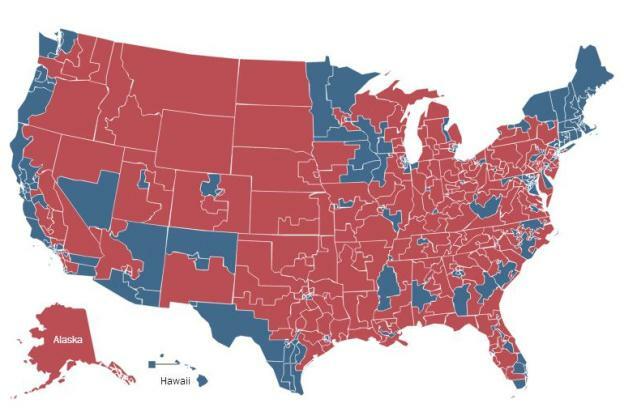 US House Districts, color coded with 2012 election results	(www.washingtonpost.com). In an article titled “Did GOP gerrymander its way to controlling U.S. House?” MinnPost’s Eric Black attempts to answer the question that is the title of the article. Here’s a case where three true things seem to point to a fourth thing, which is much less true, even though I find that many politically active liberals believe it to be true (and sort of want it to be true). Let me start with the last thing, the one that isn’t quite true. In the circles in which I travel, a lot of liberals state plainly that the Republicans retained majority control of the U.S. House in 2012 only or primarily because they out-gerrymandered the Democrats in the latest drawing of the district boundaries. This is more false than true, especially if you take seriously the “only or primarily” part. He then enumerates the three things that he deems to actually be true, since we now know that he doesn’t think the whole “Republicans retained majority control of the U.S. House in 2012 only or primarily because they out-gerrymandered the Democrats” thing is true. The three things that are true? 1) The GOP retained control of the US House of Representatives despite getting less of an overall vote share when you add up all the races. 2) 2010 was the biggest Republican election year in probably forever. At least in a non-Presidential year. They took over the US House and won a handful of Senate seats. Not only that, they won a bunch of state legislatures and governorships, giving them the redistricting trifecta in a lot of states. 3) The party in power during redistricting will almost invariably draw the political lines in their favor. I agree with all of these points. And as Mr. Black says, taken together, they really point towards that thing that he said wasn’t true at the beginning, actually being true. So what is his reasoning for why it is in fact not true? But just looking at some of the states in which Republicans did win control of the whole mechanism in 2010, when I compare the outcomes of U.S. House elections under the old maps compared with the new, it contributes little to the theory of Republican gerrymandering run amok. Wisconsin, for example, had the all-Republican lineup in 2010, but its House elections in 2012 yielded the same 5-3 Republican split as the previous election. Virginia had the all-Republican lineup and got the same 8-3 Republican split of House races in 2010 and 2012. But in Illinois, a state where Democrats had complete control of the redrawing of the map, the new map turned a House delegation that had been 11 Repubs and eight Dems heading into 2012 to a smashing reversal in favor of the Dems, who now hold a 12-6 advantage. The Democrats who drew the new map could not have been disappointed with that result. Let’s take Wisconsin as an example. The 2010 election resulted in a 5-3 Republican majority in the states delegation. But as Mr. Black pointed out, 2010 was a historically good year for Republicans. Prior to that, Democrats had a 5-3 majority in the delegation. And the Wisconsin GOP held onto their 5-3 majority in the delegation in 2012 despite Barack Obama getting 53% of the vote. This seems to be evidence of an effective gerrymander to me. Let’s look at Virginia also. After 2010 the delegation was eight Republicans to three Democrats. But prior to that it was six Democrats to five Republicans. And the delegation remained 8-3 in favor of the GOP even though President Obama got 51% of the vote. In Virginia, the GOP managed a fabulously successful gerrymander. The reason that Republicans didn’t increase their majority is because redistricting was all about protecting their majority. They didn’t carve out a lot of new seats for themselves, they took the vulnerable seats they had won in 2010 and made them safe seats. This is why the delegations of Wisconsin and Virginia didn’t change their partisan composition despite their states electorate being substantially different from 2010. The evidence that Mr. Black cites as evidence that gerrymandering didn’t really help Republicans, is in fact exactly the evidence that shows that gerrymandering really helped Republicans. Mr. Black is just looking at it in the wrong way. This is also why the example of Illinois seems so stark. Yes, it was a Democratic gerrymander, but the previous map was a Republican gerrymander. So they went from a historically good Republican year in a state with a map gerrymandered by Republicans, to a good Democratic year with a map gerrymandered by Democrats. That is how you go from an 11-8 disadvantage to a 12-6 advantage. Ohio is an absolute travesty. I am no fan of mid-decade redistricting, but if the Democrats are able to regain control of Ohio anytime this decade, basic fairness would dictate new lines be drawn. Three of these states have delegation splits really close to the Presidential vote. Iowa is as close as it can get for a four district state. Washington is also as close as it can get. Democrats have a one district advantage in Arizona, relative to what they should. But that race, won by Ron Barber, was also one of the closest in the whole country. California was an advantage to Democrats, but it’s hard to say if this is because of redistricting. California implemented an entirely new election system where all the candidates of all the parties run in the same primary and the top two go onto the general election. The system is creatively called the “top two” primary system. And because of this, it’s hard to say what impact redistricting had, and what impact the new election system had. All in all though, the states with non-partisan commissions that drew the lines were fairly neutral, while the states with full Republican control were all skewed, some pretty heavily, towards Republicans. The states with full Democratic control also skewed Democratic, but because of 2010, there just weren’t that many of those states. To be sure, gerrymandering is not the only factor at play here, Democrats tend to be concentrated in cities and Republicans spread themselves out. This is a trend we see in Minnesota legislative districts, where the most Democratic districts are significantly more Democratic then the most Republican districts are Republican. This is a thing that has been discussed on this very website in the past. This same analysis can, for the most part, be applied to the country as a whole. And this is certainly a factor. But it’s not the whole story. It’s part of the story. The other part of the story is gerrymandering. And that part of the story is a large part of why the GOP still retains control of the US House, despite the Democrats winning more US House votes.